The Uwharrie National Forest is a very popular area to prospect for gold in North Carolina. It is close to the original site where gold was first discovered in the United States. The first gold was discovered here as early as 1799, and mining and prospecting have taken place in this region ever since. The forest is primarily located within Montgomery County, with parts of the forest also in Randolph and Davidson Counties. It is situated within the Carolina Slate Belt, a mineralized zone of the Appalachian Mountains that also includes parts of Alabama, Georgia, South Carolina and Virginia. Gold can be found in many creeks and rivers in this area. The Uwharrie National Forest is one of the better places for prospectors in the Southeast to search for gold because it is one of the largest areas of public land that is gold bearing. There are considerable gold rich locations throughout North Carolina, but most are on private land. The Uwharrie is an area where most anyone can load up their gold pan and shovel and go search for some color. There are many waters within the forest where gold can be found. A few that are worthy of note are Uwharrie River, which can be accessed from Highway 109, or further downstream along River Road where it flows into Pee Dee River. Some of the smaller tributaries like Duncombe Creek, Barnes Creek, and Spencer Creek also have fine gold deposits. The area around El Dorado is generally considered the richest. There have also been some reports of good gold is also found in Big Creek. Troy is the main town located within the Uwharrie forest and gold can be found in many of the creeks around town. The ranger station is located in Troy, and it would be a good idea to check with them to get the most updated rules, since they can change at any time. Rules and regulations related to prospecting within the Uwharrie National Forest are quite a bit different than you would find in the western United States, where there are considerable amounts of public land. Unlike most forests that have always been public land, most of the forest lands in the eastern U.S. were once privately owned and were later purchased by the federal government. This means that they can be regulated differently than most other forests. In relation to gold prospecting, the main restrictions within the Uwharrie are the limits on the type of equipment that can be used. Dredging and highbanking are not legal. Gold prospectors can use shovels, pans, and sluice boxes that are manually fed with a shovel. Additionally, care must be taken to only dig in areas that are approved. These are places that are within the stream channel. You are not allowed to dig above the waterline, or dig underneath the waterline and erode it away. No damage to riparian habitat is allowed, so you must not destroy vegetation on gravel bars or anywhere that you are searching. This includes on islands that may exist within the streams or river itself. The prohibition on dredging is particularly limiting on the Uwharrie River itself, where most of the gold is at depth within the river channel, and dredging is really the only viable option to get gold from within the channel. This is unfortunate, since metal detectors are such a great tool for locating gold deposits. The only area that is designated as open for use is at Kings Mountain Beach Point, but this would be a poor location to try and find gold (except perhaps jewelry.) There are many lode mines that are found within the forest that mined for free-milling gold deposits in the ores, but locating gold veins is very difficult without the aid of a metal detector. 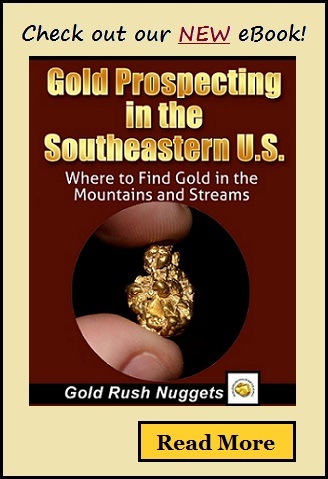 There have been nice sized gold nuggets found in North Carolina over the years, including within the Uwharrie National Forest, but for the most part it is fine placer gold deposits that are found within the creeks and rivers in the forest. Prospectors generally have the best success when they use equipment that is specially designed to capture the extra fine gold that is most common here. A basic gold pan will certainly do the job. If you want to use something larger, a sluice box is your best option to process more material in a shorter amount of time. Most of the creeks within the Uwharrie flow fairly slowly, so a standard sluice box is not as good as the type that is designed for low flow conditions. These specialized sluices will also work better to retain the tiniest gold specks that are so common here.